If you find a wild baby bunny exhibiting any of the following signs listed below, call Willowbrook Wildlife Center at 630-942-6200. I Found a Baby Bunny. What Should I Do? If you have found a baby bunny, take a few simple measures to help a baby bunny. Put the baby bunny back in its nest. Gently place the young back in the nest. It's okay to handle it with gloved hands. The mother will not reject it. Cover the young with any leftover nesting fur and dried grass. Leave the nest alone. Frequent acitvity around the nest can force the mother to abandon it. If the baby fits the following description, it may be on its own. You shouldn't expect to see the mother. She only feeds her young once or twice a day and usually at night. Otherwise, she stays away so she doesn't bring attention to the nest, which is a defense strategy that many species use. Because the female stays away for so long, people may think her young are orphaned. However, a female can raise an entire litter without ever being seen. If you're still concerned, you can check to see if the mother returns. Lightly place string or twigs over the nest in a tac-tac-toe pattern, and leave the nest overnight. If the strings are disturbed in the morning, the mother has likely been there to feed her babies. See if the young look generally healthy and are warm and active with rounded bellies. If so, the mother is present. If the babies are cold and lethargic with flattened bellies, something may have happened to their mother. Call Willowbrook Wildlife Center at 630-942-6200 for assistance. 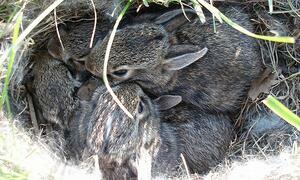 Eastern cottontails and other young wild animals are not constantly supervised by their parents. They spend much of their time alone or with siblings. Because of this, people should leave the young alone when possible. Cottontails are particularly difficult to raise in captivity, even by experts. Never use poisons. They're inhumane and may be illegal. They can also result in secondary poisoning of other wild animals or pets. It's illegal to keep wild animals, even for a short time. They have special nutritional, housing and handling needs, and inexperienced individuals who try to raise or treat them inevitably produce unhealthy, tame animals that can't survive in the wild. Willowbrook treats injured, ill and orphaned native animals to DuPage County. We do not accept skunks, bats, deer, beavers or trapped nuisance animals. We do not accept nonnative animals, including European starlings, house sparrows and pigeons. We also do not accept native wildlife raised as pets, as efforts to reverse any taming or imprinting are unsuccessful.